Putting together your college dorm checklist is hard work! You have so many things to think of and decide on that you're probably going to get a little overwhelmed. When there's so many things to think of, it can be easy to forget some dorm essentials here or there. That means you're always going to be adding dorm necessities to that college supplies checklist so that it never seems like it is done. Some dorm items you want to make sure you have are wall decorations for dorms. Your college dorm room is supposed to be ultimately comfortable and one way of making it comfortable is by adding color and style to those college dorm room walls with some cool posters for dorm rooms! 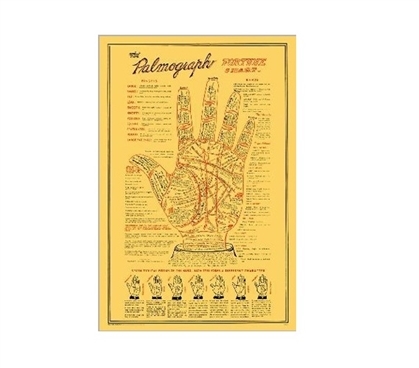 Our Palmograph College Poster has a classic style that looks extra cool for dorm room decor. This cool poster for dorm rooms features a palmograph with a drawing of a hand. Surrounding the drawing is information about palm reading. With the red highlights and cool classic style of this cheap dorm room decor item, you'll have some unique dorm wall art pieces to add to your college wall decor. The hand and information are on a yellow backdrop, adding to the classic and rustic style of this college wall decor item.